Thank you Rowaida! You’re so kind! Thanks Rola! I’m not very good at making them with icing. 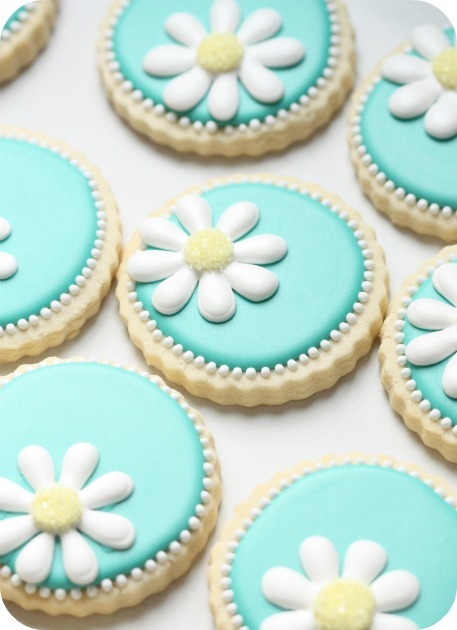 If I do make them I usually make them with gumpaste and I use Peggy Porschen’s way of doing them. Sorry I’m not more help with that! Wow, these are super adorable and I love the colors! Great tutorial. Yikes! Thanks for noticing that! They’re definitely not 3/4 of an inch if I had been using my noggin while I was typing- that’s SO thick. I think you can tell by the pictures that they’re about 1cm! Thanks! I thank you!! You’re great!!! I just used your fabulous tutorial to make these cookies! I hope they are a huge hit at our Easter get together. I’m not a decorator by any means, but I was able to get beautiful looking cookies following your simple directions. Thanks so much! 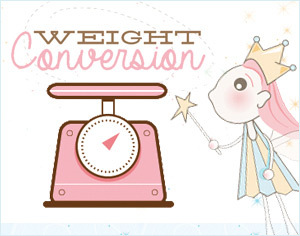 I just discovered your site from Foodbuzz Top 9 and am in love with all these creative and beautiful ideas! 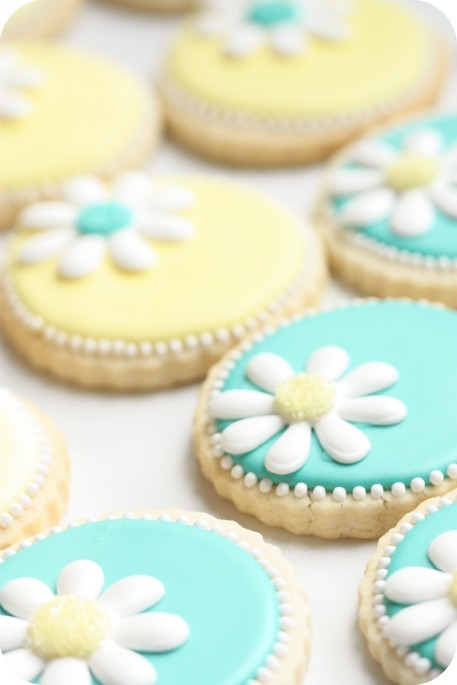 I especially love these daisy cookies. How pretty! You make it look so easy. I think I’ll make these for a Mother’s Day bake sale. I am bookmarking your site and will be following for more great ideas and inspiration! Really thank for your wonderful tutorials, your detailed instructions are absolutlely helpful! Could you please tell how can we have a shiny icing? 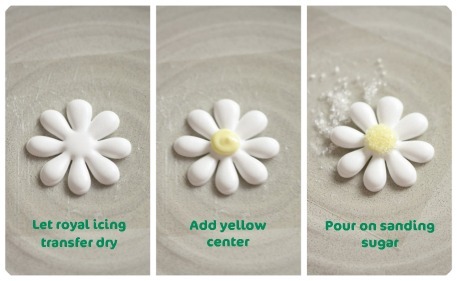 I usually use this recipe: powdered sugar + lemon juice + egg white, is this the same I mean in result for decorating? Hi Sunshine, Many of my shiny pics of cookies are when the icing is still wet, but you can add a little corn syrup to the royal icing to add a bit of shine, or try putting PME lustre spray (pearl) on. I decorate cookies as well and would hate for someone to use my pics as if they were their own. Thanks! I’m not on etsy, and yes, they’ve used my photograph without permission. I’ll send them a quick note. Thank you Teresa!! HI ! These cookies are so beautiful. I love them! I have just started making Royal Icing decorated cookies – could I ask you a few questions?? 1. You mention to add corn syrup to the icing to make it shiny – I’ve been told to use glycerine to make them shiny and not set too hard so the icing doesn’t crack when bitten…have you heard that? 3. I add vanilla extract to my recipe because I like the taste better but I have been having some issues with the color getting blotchy after it has dried – have you ever had that problem? I wonder if it is related to the extract? Thanks in advance for any help – you are so talented!! Sometimes I wonder if that issue happens because grease from the cookie goes up into the icing. (Maybe need to try a dif. cookie recipe, dif. icing recipe, or both). thanks so much for the generous sharing! I’m giving these techniques a try, with limited success so far (practice, practice, practice!). Could I ask? what diameter are the sugar cookies in this tutorial? likewise the daisies? maybe I’m trying to work on too small a scale (as a beginner!). spookercat, I checked the cookie cutter I used – they are 9cm in diameter; and yes, it is easier to work on a larger cookie! 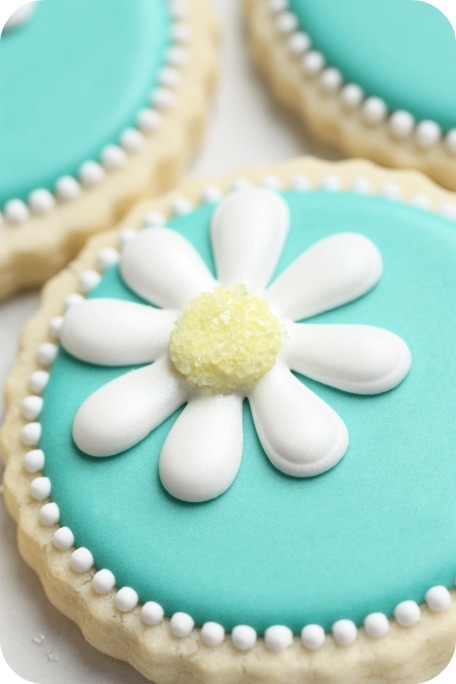 I don’t have the daisy stuff anymore but I’m guessing if the cookie was 9cm, the daisy would have been about 4-5cm. Good luck! You will get better with practice and with tips and tricks! I let them cool thoroughly first and then I usually leave mine on the baking sheet and cover the baking sheet with saran wrap or foil until I decorate them. You can actually buy covers for baking sheets, but I don’t own any. If I don’t have enough baking sheets I do put them in an airtight container between layers of parchment. You seem like you’re very prepared and organized! 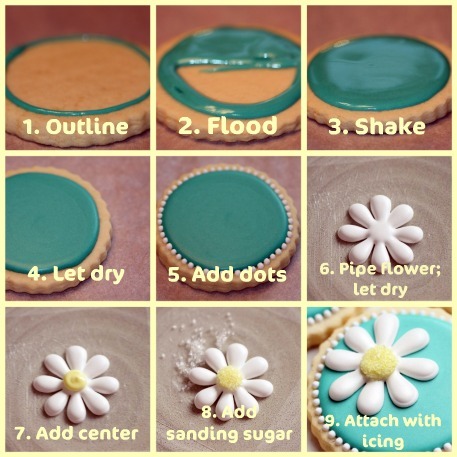 For your first time, don’t be too hard on yourself; the cookie decorating tutorial and the top 10 tips I have will help (especially like the tip about letting your icing just fall when you’re making outlines etc. – that one helped improve my piping a lot), but a little bit of practice goes a long way too, so the most important thing is to have fun! Would love if you come back and share your cookies here or on facebook. Did you ever perfect the chocolate sugar cookie receipe? JUst started to use my new kopykake, so I have a question, how do you keep your hand out of the light? I know it sound silly but everytime I went to outline my hand was in the light. Any tips would be helpful. Super Cute! I plan on making these for my daughters girl scout Daisy Troup. I am new to baking cookies, and love your site! 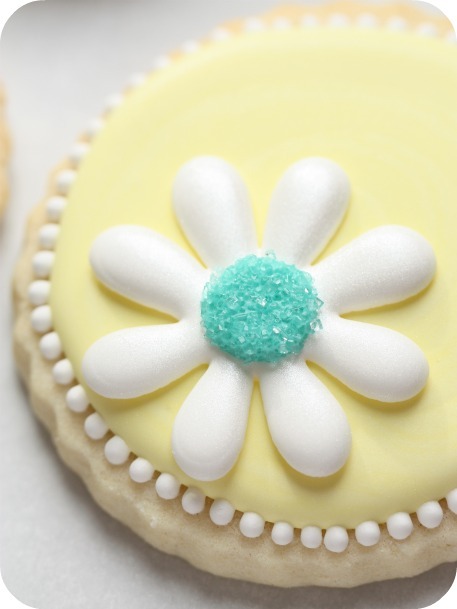 What tip do you use to make the border on this daisy cookie? Do you just squeeze a little icing out and touch up any “point” left on the ball with a brush? They balls are so perfectly round! Thank you so much! These cookies are absolutely adorable! 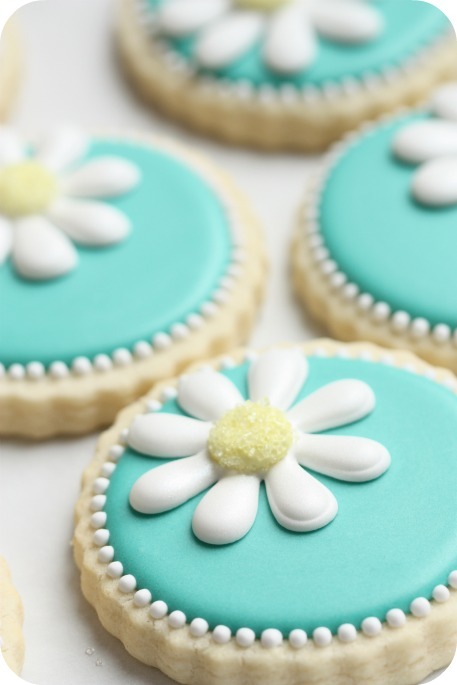 I am planning my cousins baby shower & she love love loves daisy’s & her theme will be daisy’s as well. I was wondering if you sell them? Please let me know, thank you very much! I love your website and your work, simply amazing! These cookies are amazing! You are oh so very creative! I just found you via Stumble Upon and I’m so glad I did. Thank you. Hi @ Lucia: No sorry, I don’t, but you can find talented decorators in the Decorator Directory in the sidebar of the blog. Thanks @ Shirley from Funchkins! @ Jan: I haven’t tried butter, so I’m not really sure if it would work, sorry. Another thing you can use if you’re concerned about both issues you mentioned, is simple parchment paper. 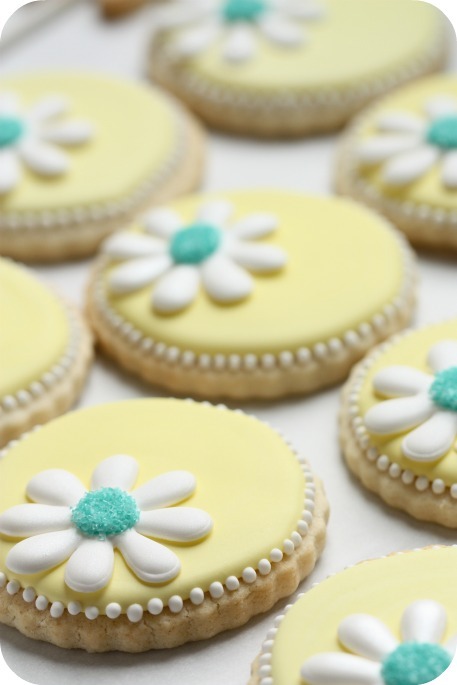 I loved watching your daisy cookie tutorial…what a great way to start my day! Thanks for sharing so much with us! I think I may need a KopyKake projector from Santa this year…I’m not sure that I can wait that long? hi marian, my name is laura and i´m 14 years old. i made this cookies for a bake sale they took a lot of time and hard work but evry body loved them! Hee hee @ Jules, I know the feeling! You make that look soooo easy! These cookies are absolutely beautiful. Thanks for sharing. 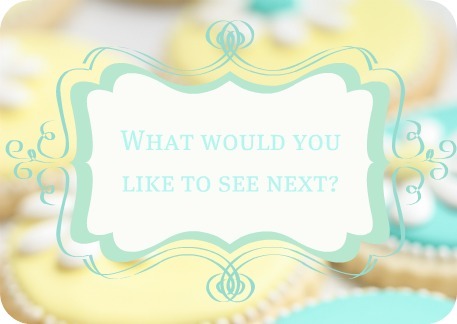 My first grandbaby will be born soon….her name is going to be Daisy….I can’t wait to make these cookies for her Mommy after she is born!! Thanks for the video and the ideas….plain, simple to understand and you did a top knot job!!!! Thank you!! What food coloring markers do you use to line your cookies? Thanks for all your comments @ Mary McCord, @ Anita Barker, @ Deedra! What was the size of the second cookie cutter that you used? Your work is beautiful and I love the tutorials on your website. do. They turned out just great. and easy to follow instruction. I’d like to ask if where do you keep the cookies while letting the icing completely dry for 24 hrs? I love your works, you’re an inspiration to aspiring bakers like me. You’re very helpful, thank you and hope to meet you one day!